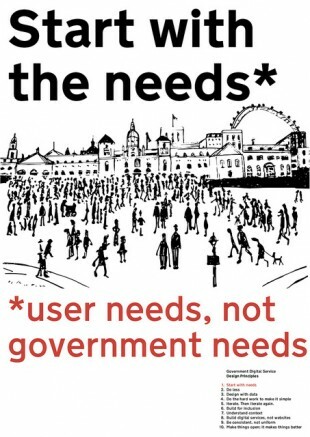 All content on GOV.UK should start with needs. Before creating a detailed guide, you must specify the user need. We've released a feature to allow you to associate detailed guides in Whitehall Publisher with user needs in Maslow (a tool to manage user needs). Needs should be proposed in Maslow. We are adding needs to Maslow all the time, new ones for transitioning agencies, and also those needs we've already identified and met on GOV.UK. 1. 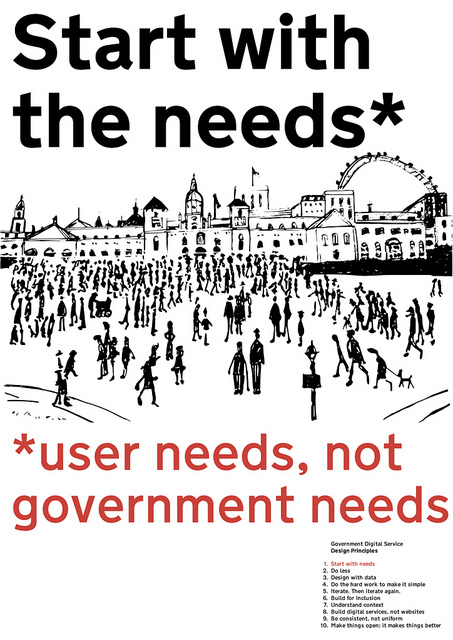 Propose the user need in Maslow (use the support form to ask your Transition Manager or the GOV.UK team for help with access). 2. Check that the best way of meeting that need is with a detailed guide. 3. Get the Maslow Need ID (starts with 10XXXX). 4. Add the ID to the 'Maslow Need IDs' field under 'Associations' on the editing form in Whitehall Publisher. You can add more than one ID if the detailed guide meets multiple needs. 5. Once published, the detailed guide will then appear in the 'Content on GOV.UK which meets this need' section for that User Need in Maslow. 1. 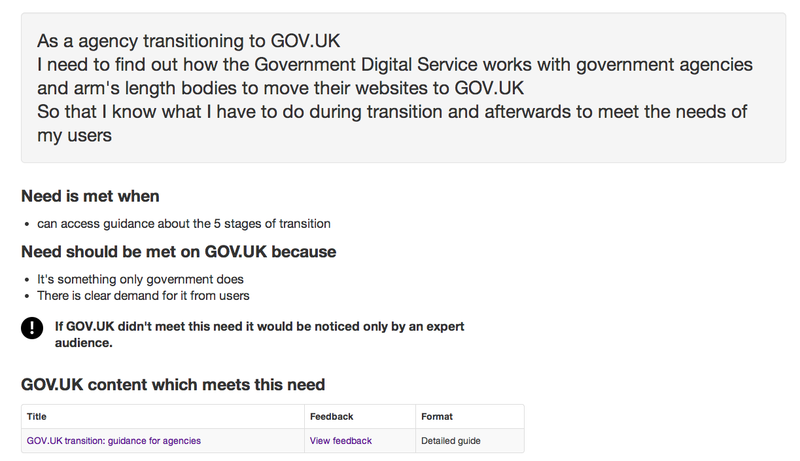 User need proposed: As a agency transitioning to GOV.UK, I need to find out how GDS works with government agencies and arm's length bodies to move their websites to GOV.UK, so that I know what I have to do during transition and afterwards to meet the needs of my users. 2. 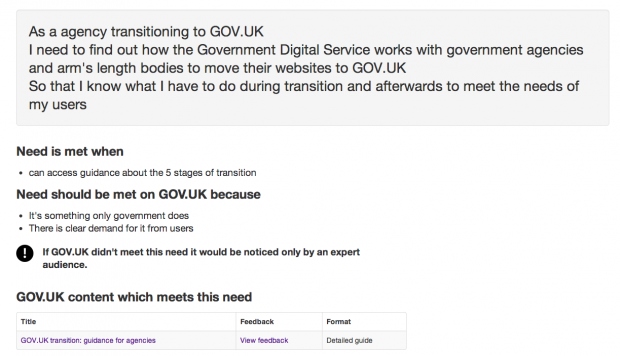 This need is met by a detailed guide: GOV.UK transition: guidance for agencies. 3. Edit the detailed guide in Whitehall Publisher to add the Need ID: 101213 and publish it. 4. Note that: GOV.UK transition: guidance for agencies is now listed under the 'Content on GOV.UK which meets this need' section in Maslow. Hello Pete - yes, the grammatical error is frustrating and something we know about. The "As a..." is hardcoded in Maslow. We've got some thoughts on how to handle it, we've not been able to prioritise this yet. Is there any way to use Maslow if you are outside of GDS at all or is it an internal-only tool?